The Pro8600 will definitely make you see the light, but is it worth the price tag? 1. Introduction, specifications and performance. 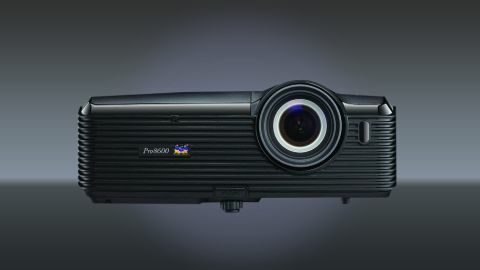 As a catch-all projector for any environment and scenario, the Pro8600 isn't the final solution, but for many users its high brightness will trump its low resolution. This is one bright beamer. Capable of pumping out 6,000 lumens for the paltry sum of around £1,500 ($2520/AUS$2719), ViewSonic has come up with something genuinely exciting. Add an ability to simultaneously display the desktops of four computer screens and the Pro8600 seems like the ideal solution for collaboration. Add DLP Link 3D readiness and the Pro8600 could be perfect for some, but there are aspects about the Pro8600 that make it anything but cutting-edge. Our major worry is detail – or lack of. If an XGA resolution (1024 x 768 pixels) for this kind of money seems unreasonable (particularly if it's then divvied-up between four computers), we're also not convinced by its 4:3 native shape. We would have preferred 16:10. Weighing 3.86kg and measuring 333 x 263 x 110mm, the Pro8600 comes in a handy carry case, though it's pretty basic stuff; the wraparound zip is handy for quickly extracting the Pro8600, and so too is the front section for all cables, but the fabric just doesn't seem strong enough. It comes with a shoulder strap, but it's a flimsy solution and we're not sure many people will risk carting around a £1,500 projector using only that for support. The Pro8600 is networkable, but only via wired LAN; WiFi is only a possibility if you purchase an optional WiFi dongle from ViewSonic. That's a blow. Although the Pro8600 is all about collaboration and networking, there's a lot of versatility lent to it by its busy ins and outs panel on the rear. The HDMI input is perhaps the most crucial from a single user's perspective, though there's also a composite video input alongside a set of component video inputs and even S-video. Two computers can be hooked-up via VGA, while there's a monitor out, a 12v trigger out and a RS-232 control port, too. The latter is complemented by the Pro8600's integration into control systems from Crestron RoomView network management system. Audio is also attended two; the rear sports left/right analogue phono inputs are here for simple old-school audio, two mini-jack audio inputs and a slot for a microphone. Three USB slots are included; Type A for inserting USB thumbdrives (though only JPEG files are supported) or for hooking-up a laptop, card reader or WiFi dongle, and a Mini USB. The third is a Type B service port only, or for mouse control. The reomte control is small and mostly unappealing, though it does have an especially welcome characteristic; a red laser pointer that's destined to be loved by Powerpoint junkies. Setting-up the Pro8600 is relatively easy. The 1.8m power cord helps a lot, while the 1.5x optical zoom helped us get an 80-inch image from around three metres. However, we can't stress enough how much we miss left and right lens shift dials, which are increasingly common on projectors and do let a projector be positioned a long way off-centre to a screen, but the Pro8600's keystone correction proves just enough to help us achieve a straight-on image. The BrilliantColor tech on this six-segment DLP projector works well, though the difference in luminosity between the Brightest, PC and ViewMatch picture presets isn't much. Much moodier is the Movie preset, though there are also dedicated WhiteBoard and GreenBoard modes. However, although it can pass-through Full 1080p signals from a Blu-ray player, the XGA resolution isn't anywhere near enough to show that high definition detail, so the image is't as impressive as it could be. Since many new smartphones have a higher resolution than the Pro8600, we're right to feel a little disappointed. The pixel grid is pretty obvious from a few metres away, and we also noticed a touch of flicker, and some rainbow effect from its spinning colour wheel (though not everyone is susceptible to the latter). Black levels are relatively poor, too, with a distinct greyness evident in all images featuring blocks of black. Motion blur during video playback, so often an endemic problem with data projectors, isn't much of an issue on the Pro8600. Still, the image is always bright, and in our test PDF, Word, Excel and PowerPoint files looked relatively sharp and crisp on the screen, though stand too close and jagged edges – a symptom of the low resolution image – once again become too dominant. We're slightly concerned about media handling. The Pro8600's rudimentary Ruby SDK Image Viewer software proffered only JPEG images from a USB stick inserted in the rear despite it being rammed full of all kinds of document, video and music files. The biggest issue for the Pro8600 is the noise from the cooling fan, which spits-out 65 decibels in Brightest mode. That's slightly lower than we had expected (having reviewed ViewSonic's same-chassis Pro8530HD), but it's still distracting. However, there is a novel solution; dive into the settings menu and toggle-on the ECO Mode, which halves the audible noise while only reducing brightness by a little. Talking of audibles, the Pro8600's built-in speakers aren't as loud as we'd hoped and almost completely miss-out bass, but we were impressed not only by the stereo array and positioning (on the sides of the projector's chassis, towards the back), but also the detail. Current page: Introduction, specifications and performance.